The Paulaner am Nockherberg beer garden is located on the east side of the Isar river near the Deutsche Museum. In 1634 monks began brewing beer at this location which was a monastery. At the time the beer was only available to monks but in 1780 the beer hall, then known as the Salvator-Keller, opened to the public. In 1799 the monastery closed. In 1994 the name changed to Paulaner-Keller. Today, the location is known as Paulaner am Nockherberg or simply as “Nockherberg” in reference to the hilltop upon which the beer hall, beer garden as well as a Paulaner brewery is located. The beer garden has 3,000 seats divided into a large self-service area (2,000 seats) with beer benches as well as regular tables and chairs and a smaller serviced area (1,000 seats). 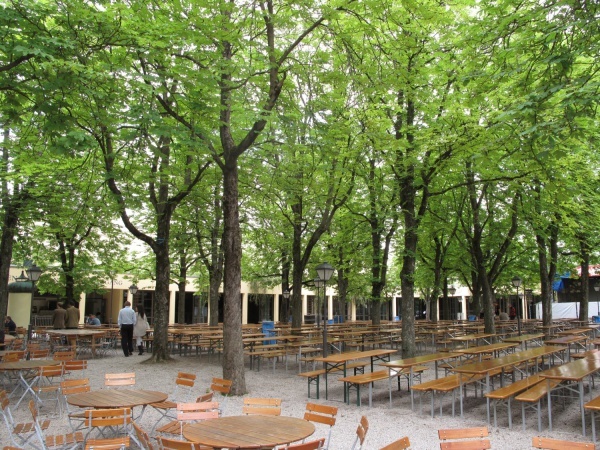 The beer garden is well shaded by a high canopy of tall chestnut trees. A large self service food stall offers a wide variety of traditional Bavarian meals and snacks. The Paulaner Hell (lager) costs €8.10 p/Maß (May 2016). The adjoining beer hall is famous for its Starkbierfest starting early or middle of March and lasting for 17 days. The Salvator beer served at this time is a strong dark beer which is still brewed according to its original 1773 recipe. An event at this beer garden is the annual Lampionfest (Chinese lantern festival) whereby 1,000 colourful Chinese lanterns lit up the beer garden in combination a live band. The event takes place for one evening only usually in July. Depending on the weather, the serviced area of the beer garden is open between 10am to 1am Monday to Sunday while the self-service area is open between 12 noon until midnight.